If you're looking for a budget cruise line to exotic destinations then Costa Cruises is the line for you. Costa is a subsidiary of Carnival Cruises, operating in the Europe, Asia and Australia areas. At the moment there aren't any Costa Cruises to or from Cape Town, however there are plenty in the Mediterranean, Mauritius, the Maldives, Singapore and China. Costa's cruises are most reasonably priced - Costa caters for the same segment of the market as MSC Cruises, operating in the affordable market. Email cruises@southafrica.to to book a Costa Cruise (please specify if you'd like flights, insurance and any accommodation included). 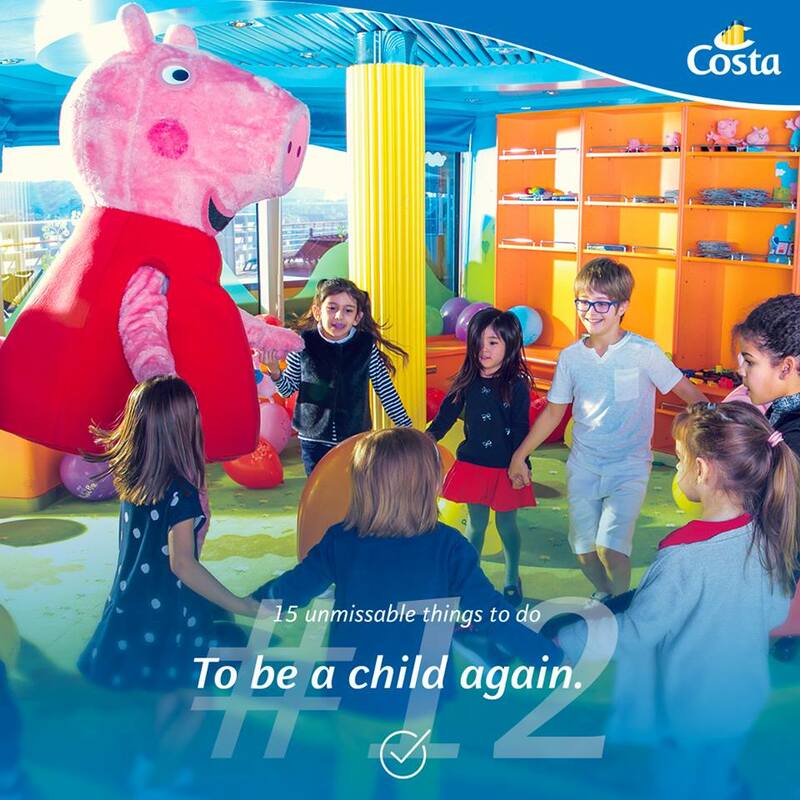 Costa Cruises sometimes run specials where up to 2 children cruise for free (under 13 at the end of the cruise) if they are sharing their cabin with 2 adults - ask your consultant for details. Ships have dedicated Peppa Pig areas which were set up working together with Leolandia amusement park. The kiddies swimming pool is based on the Peppa Pig pirates theme with a treasure island, lighthouse and Grandpa Pig's ship. Many Costa ships have a "Squok Club", dedicated to keeping the children happy with activities like scavenger hunts, painting and cooking. Two new ships which Costa are building are the Costa Smeralda and the Costa Venezia. A sister ship to the Venezia is due to be delivered in 2020. The Costa Smeralda is busy being built and will become Costa Cruises' first LNG powered vessel. She is due for delivery in Oct 2019. It is being built at the Meyer Turku shipyar. The Smeralda will follow Carnival Cruises' AidaPrima which also uses LNG. The Smeralda will be refueled with LNG via ship-to-ship bunkering, and the ship can operate for 14 days before needing to refuel again. The Costa Venezia is scheduled to be christened in March 2019 and leave Triste for Shanghai, and will be year-round in China. The ship is so-named as there will be a masked ball, Venice Carnival style, on each cruise. The Venezia will be able to accommodate a maximum of 5260 pax in 2116 cabins. In November 2017 the keel-laying ceremony took place, with a special coin, containing the ship's name and the guests at the ceremony, being placed into the keel. The Costa Venezia's sister ship is due to be launched in 2020. In January 2015 the Costa Atlantica became the first ship to drydock in the Huarun Dadong Dockyard in China; maintaining and repairing the spa, gym and 52 cabins. Since September 2017, passengers on the Costa Atlantica have been able to pay for goods and services using a WeChat service. This is the first Costa ship on which this online payment option has been launched. The plan is for the WeChat app eventually being used to find your way around the ship, check-in, and research shore excurions. An interesting aside for South Africans, is that WeChat is owned by Tencent, which in turn is partially owned by Naspers, which is the largest listed company on the Johannesburg Stock Exchange. So, there we go - cruise on the Costa Atlantica to suppport a South African company! The Costa Dieadema is Costa's flagship. In July 2016 Costa put Pepper to work - she's a human-like robot, and her job is to entertain passengers, and is trilingual - speaking English, French & Italian. 12 May 2018 to 25 Aug 2018. Baltic cruises from Stockholm to Helsinki, St Petersburg and Talinn. In November 2017 the Magica went into the ry dock in Marseille where work was done on the public areas, the Bellagio Buffet area, the spa, an addition of the Gelateria Amarillo and the Vicenza Club Restaurant. On the 3rd Feb 2018 the Costa Mediterranea cruises from Dubai to Abu Dhabi, Sir BAni Yas Island and Muscat, before returning to Dubai. There are some great specials for this cruise - ask your consultant to assist. The Costa neoRomantica sports 11 bars (including a cigar & cognac bar), 4 restaurants, 4 pools (one with a waterslide), 6 jacuzzis and a spa, gym, sauna & turkish bath. 6 Feb 2018. A fashion show by Jessica Minh Anh is hosted on the neoRomantica. In April 2017 the Costa neoRomantica was offering 6 night cruises from Tokyo to other parts of Japan and South Korea. 19 Dec 2017. The Costa Pacifica makes its inaugural visit to the Port of Bridgetown. May 2018 the Costa sails to South Korea for 2 charter cruises with Lotte Tour. Oct 2018 to Mar 2019 the Costa Victoria is based in Mauritius; with 14 night round-trip cruises from Mauritius's Port Louis to the Seychelles, Madagascar, Reunion and then back to Mauritius. Feb 2018 to Sep 2018 the Costa Victoria is based in the Med. Jan 2018 to Feb 2018 the Costa Victoria is based in Singapore; with 7 night cruises from Singapore to Ko Samui (Thailand), Bangkok (Thailand), Sihanoukville (Cambodia) and then back to Singapore; immediately followe by another 7 night cruise from Singapore to Kuala Lumpur (Malaysia), Langkawi (Malaysia), Phuket (Thailand), Penang (Malaysia), Malacca (Malaysia) and then back to Singapore. 2019 Costa has undertaken to cruise year-round from Tianjin. The Costa Fortuna is being redepoyed to Europe, with it being replaced by a new vessel being constructed. March 2019. The Costa Venezia's inaugural cruise; from Trieste to Shanghai, where she'll full time serve the Chinese market. 2016 the Costa Fortuna is redeployed to Shanghai; making China Costa's largest market. 2015 the Costa Serena is sent to China for all year round cruises. 2010 the Costa neoRomatica became the first cruise ship to stop at the new facility for cruise lines in Tianjin. 2009 Costa increased its capacity in China by 80%, introducing the Costa Classica to China. 2006 the Costa Allegro became the first international cruise ship to home port in China. Regular cruises from Mumbai to the Maldives are offered on the Costa neoClassica. These are 7 day cruises from Mumbai to New Mangalore, Cochrane and the Maldives. Costa typically adjusts its menus for cruises from India to allow for Indian food as well as Jain food. Alternatively, go for an epic 14 day cruise from Mumbai to New Mangalore, Cochin, Maldives, Colombo (Sri Lanka), Goa and then back to Mumbai. There are relatively cheap flights from South Africa to Mumbai with Emirates; which can be packaged in. From the 1st December 2018 until the 9th March 2019 the Costa neoRiviera will be cruising between Mumbai and the Maldives. The MSC Sinfonia an MS Costa neoRiviera were the first ships to dock at Port Victoria (Seychelles) in October 2017, to start the season (ends around April). Savona to Barcelona, Civitavecchia and back to Savona. Savona to Naples, Heraklion, Aqaba, Eilat, Salalah, Muscat, Fujayrah Khor Fakkan, Abu Dhabi and Dubai. In October 2017 Costa announced that they were going to set up excursions which focussed on travelling to smaller, lessor known towns in Italy: Arqua Petrarca, Castiglione di Sicilia, Civita di Bagnoregio, Locorotondo, Montalbano Elicona, Montemarcello, Orvieto, Salemi and Seborga. The excursions are being launched from stops at Bari, Civitavecchia, Messina, Palermo and Venice. 21 to 31 Dec 2013. Cruise from Mauritius to Cape Town on the Costa neoRomantica - 10 nts. . Mauritius, Reunion, Richards Bay, Durban, Cape Town. 31 Dec 2013 to 21 Jan 2014. Cruise from Cape Town to Savona (Italy) - Costa neoRomantica - 20 nights. Visits Walvis Bay, St Helena Island, Dakar, St Cruz de Tenerife, Funchal Madeira, Malaga & Marseille. For better or worse, Costa Cruises offers internet on its ships via wifi, which should be available at your cabin as well. The cost was recently (Nov 2017) priced at $30 per meg (may have changed). Bruno Barbieri, an Italian celebrity chef, designed a menu which is used across Costa's fleet. Costa has a heart warming food for charity program with Fondazione Banco Alimentare Onlus; whereby surplus food is given to the charity who pass it on to people in need. The program is currently (December 2017) operating in Savona and Rome, Italy. 10 Nov 2017. Sometims things don't go as planned, and to enjoy your cruise you need to learn to roll with the punches. A Costa neoRiviera cruise to the Vanilla Island - Reunion, Mauritius, Madagascar and the Seychelles - had the stops at Madagascar and Mautirius cancelled as a result of of bubonic and pneumonic plague (the so-called black death) breaking out on the island of Madagascar, and Mauritian authorities wanting to quarantine the ship. Pax were offered 150 Euros each on-board spending as compensation. Unhappy passengrs, some sixty of them, drummed on their supper tables in protest. Eventually, the captain phoned the police in the Seychelles, and a passenger (accompanied by his wife) was taken off the ship. The passenger spent 2 nights in a hotel in the Seychelles before being flown home (at Costa's expense). 16 Oct 2017. Costa is allowing its onshore employees to work from home (or anywhere with an online connection) on one day a week. This will apply to about 1300 employees; 1000 at the line's Genoa offices, as well as 300 based elsewhere in Italy and in other countries. August 2016. Costa cruises purchases a one third stake in Chantier Naval de Marseille, which in 2017 completed building the largest drydock in the Med.